Now that we’ve got that Olivia Newton-John 80s anthem stuck in your head, are you also picturing the fluoro spandex, rippling muscles and sweet sweatbands that helped make that track so famous? Content takes many forms, and while blogs and articles are fantastic on many levels, neglecting to use visual content would be like forgetting to add the sound to a television commercial. You know what they say about a picture being worth a thousand words – we say, when done well, each one of those words is a ‘like’. People respond to images. Visuals can work wonders in many ways, but we’ll focus on two main areas: on your social media profiles and your company blog. Almost half (47%) of internet users share photo or video content on their social media profiles. There are somewhere around 12.7 million internet subscribers in Australia (out of nearly 24 million people). You don’t need to work in the accounts department to figure out those odds. Let’s start with the big one – Facebook. When Hubspot took a close look at how an image could boost engagement, the company found that a post with a picture would get an average of 53% more likes than your usual. If that’s not enough, such posts would also receive an eye-watering 104 % more shares. Getting those likes and shares on Facebook is doubly sweet, as one of the company’s latest algorithm updates means that in order to provide users with fewer promotional posts and more content they are going to enjoy seeing, the feed will automatically show posts that have attracted plenty of engagement. Twitter has also made moves in the past to encourage people to share more images and videos, introducing visual previews back in 2013. Fast Company did a little testing of their own from 100 of their tweets. With this data, they determined that tweets with images (as opposed to those without) won 18% more clicks, 89% more favourites, and 150% more retweets. 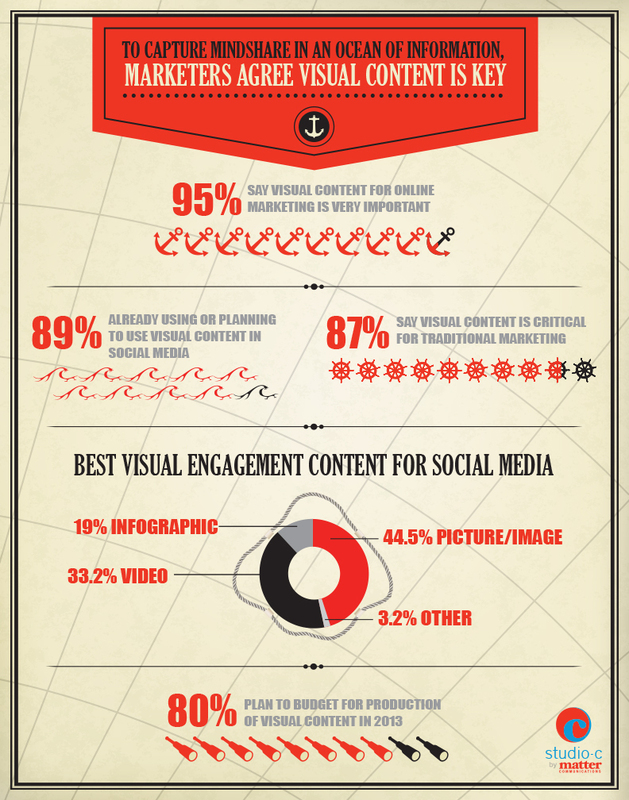 As for what that visual could be, a picture or image comes in first place with 44.5%, followed by an infographic at 19% and 33.2% for video. Keep up the image love when you plan content for your company’s website as well. No matter how well written your text is, visual elements help break up paragraphs and can save you from detailed explanations. If your company prefers to stick to a more formal tone and style, consider adding visuals in the way of infographics or infoimages. An infoimage is a snippet of information delivered in a visual format (see above), while a full infographic covers a number of statistics (say, 15 Reasons to Hug an Australian today) with an eye-catching design. One point to remember whenever you use images for your blog or on social media is to make sure you have the right permissions. You can’t simply grab any old photo from Google search. Instead, purchase the rights to images from a photo library such as Shutterstock, use your own images, or be very careful about requesting permission from the owner and attributing the content where necessary. Looking for memorable, perfectly curated content for your business? Get in touch with the team at Croud Australia.